Nikita Lalwani was born in Rajasthan, India but was one when her family relocated to Cardiff. She lives in London with her husband and child. After studying English at Bristol University, she went on to work for the BBC, directing factual television and documentaries. Her first novel, 'Gifted' was longlisted for the Man Booker Prize (2007), shortlisted for the Costa First Novel Award and the Sunday Times Young Writer of the Year. It is currently being translated into 16 languages. Gifted is more of an coming-to-age novel. It portrays Rumi as the main character who is a mathematical genius. The immigrant attitude is very evident in the depiction of the parents Mahesh and Shreene done wonderfully by Nikita in the novel. As the parent gradually loose Rumi to the adulthood and consequently to independence, their desperation heightens. Its a novel that many of us could identify with and it show cases brilliantly the talent that Nikita has as a writer. Her most recent publication is an essay in the anthology AIDS SUTRA. 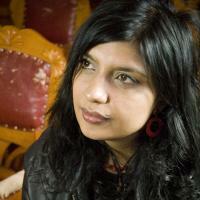 In June 2008 Nikita Lalwani won the Desmond Elliot Prize for New Fiction. She collaborated with poet and refugee Mir Mahfuz Ali to write a poem that was used as part of Liberty’s Charge or Release campaign and performed on The Verb for BBC Radio 3 as part of National Refugee Week. Gifted was adapted for BBC Radio 4 as a drama for Woman’s Hour, which won the Best Radio Drama category in the Mental Health Media Awards 2008. Nikita also contributes articles in The Guardian. Read a review of "Gifted" here and here.